Michelle has brought you and ADORABLE project today! It's not only a box, but 8 tags inside. As soon as she knew our focus was Cookie Cutter Christmas, she went to work, and came up with this JUST FOR YOU! To go along with the Cookie Cutter Christmas this week I decided to use the White Boxes again! This time I decorated it simple and then made coordinating tags that will fit inside. I made eight different tags but you could make two of each of them and all 16 would fit nicely in one box! This would be such a cute gift! Here’s some upclose of the individual tags. The backs are stamped with the To: From: stamp. I love the Candy Cane Lane Designer Series Paper. I used that on every tag. 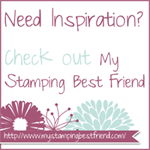 Michelle Litwiller is Ronda Wade’s assistant and has been a Stampin’ Up Demonstrator since 2009.